SMC brings you to enjoy real Green Living & Energy cost saving. According to the U.S. Department of Energy, fans create a wind chill effect that will make you more comfortable in your home no matter it is ceiling fans, table fans, floor fans, and fans mounted to walls. 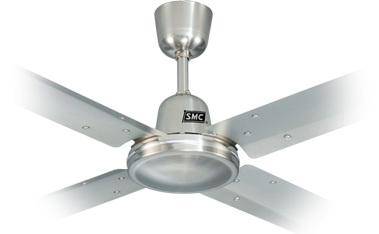 It also points out that ceiling fans are considered the most effective to circulate the air in a room for wind chill. In hot summer, when you use fan in air conditioning environment, it will allow you to raise the thermostat setting without reduction in comfort. The Department of Energy in Taiwan indicates that 6% of energy (electricity) of air conditioning will be saved by raising 1oC in thermostat setting. Moreover, in moderately hot weather, it may even allow you to avoid using your air conditioner altogether. It significantly saves energy (electricity) to your air conditioning. The fossil fuel is still dominated in the energy mix of most counties. The emission of carbon dioxide can be reduced by the save of energy by using fans, especially ceiling fans. To be the friend of earth, please buy suitable fan for your home now.